A MAN WHO squirted acid in a crowded nightclub injuring over 20 people has been found guilty of a string of offences. 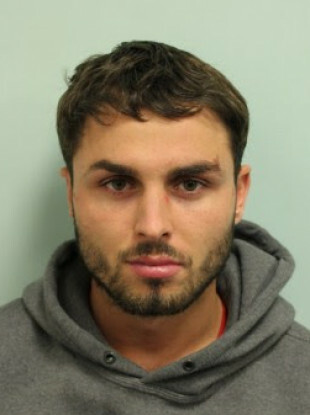 Arthur Collins, 25, the ex-partner of reality star Ferne McCann, was found guilty of the offences after a five week trial at Wood Green Crown Court in London. Collins was found guilty of five counts of wounding with intent to do grievous bodily harm and nine counts of assault causing actual bodily harm. He will be sentenced on 19 December. Police were called to Mangle event venue on Warburton Road in Hackney, at around 1.15am on 17 April this year to reports of people injured by a noxious substance. A total of 22 people reported injuries to police – of whom 16 suffered serious burn injuries. In the immediate aftermath, two men aged 24 and 29 were transferred to a specialist burns hospital in Essex where they were described as being in a serious condition. They have since made full recoveries. Officers believe a dispute between two groups of people developed inside the venue, resulting in acid being sprayed by a male suspect directly at the men. Email “Ex-partner of reality star found guilty of acid attack outside London nightclub”. Feedback on “Ex-partner of reality star found guilty of acid attack outside London nightclub”.